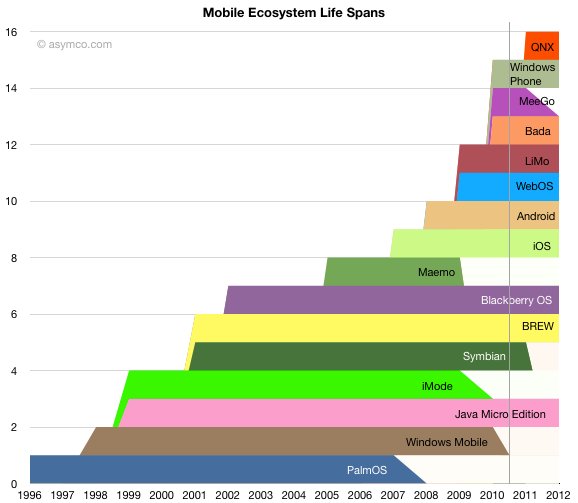 To illustrate I built the following chart showing the history of all major mobile platforms. The are ranked by launch date (earliest at the bottom). A vertical line marks the present. End dates are approximate and based on declarations of end of life rather than end of usage. There have been 16 total mobile platforms, 10 of which are still (or soon will be) on the market. Of the six that were terminated, three had replacements built by the same orchestrating company (Windows Mobile begat Windows Phone; Maemo begat MeeGo, and PalmOS eventually led to WebOS.) Only three reached end of life with no known descendant (iMode, MeeGo and Symbian). Operating systems that were launched in the 1990s or early 2000s have mostly been withdrawn/replaced with the exception of Java and BREW. “Modern” operating systems all emerged after 2007 (following iOS). A total of eight such new OSs were introduced in four years. What I find noteworthy is that there is an implied peculiar fatalism about the market when only two platforms are considered viable, neither of which are more than 3 years old. While visiting the Mobile World Congress, I sensed this jumping to conclusions about platforms was eerily similar to that of a few years ago when new entrants like Apple and Google were declared dead on arrival. I can only conclude that there is a great deal of groupthink going on in the industry. A perfect setting for a disruptive entrant to change everything, all over again. I excluded some platforms like Motorola’s Linux, SavaJe and perhaps some others (Openmoko, Qtopia) which did not gain significant traction. I also excluded any embedded OSs which did not have native APIs. The end of MeeGo is speculative. Intel is still defending it and may continue developing it. Android variants like Tapas could be considered new platforms, but I maintain them as part of one OS for the time being. ‹ Previous Post Where is the Windows Phone Tablet? › Next Post Platform sunk (cost): What is the value of a quarter billion Symbian users?